to 911 calls and the of broadcasting of Court TV (now Tru TV), precise synchronized time is essential for the law enforcement and the judicial systems. On the other hand, it should be noted that sometimes the police will take whatever they can get, as evidenced by the far less precise chronologies derived from the likes of insects and their maggots on corpses (often shown in the various CSI TV shows). Lesson learned: Precision is always relative to the task at hand. Where were you during the crime? And where are you now? These are the two most pressing questions faced by crime scene detectives when dealing with suspects. GPS is typically used to deliver precise location to help law enforcement officials find their GPS tracking devices, sometimes covertly hidden in suspects’ vehicles and contraband. We use the same system to provide precise time to Masterclock devices. Oscillating quartz and higher quality rubidium crystals regulate time in most Masterclock devices. Along the same lines, did you know that an oscillating tuning fork stands in for a speeding vehicle in radar gun calibration tests? 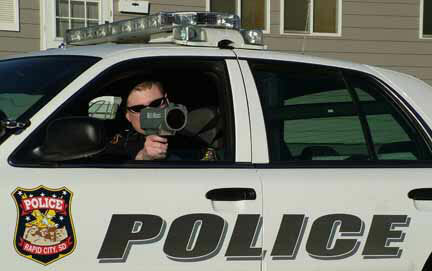 Most radar guns are allowed a frequency uncertainty of 0.1%, which translates to half a mile per hour at 50mph. As we all know, tickets are seldom issued unless the speed is exceeded by several miles per hour, often 10% or more of the posted speed limit. So if you’re clocked speeding, you can’t blame the gun. Nowadays virtually everything has a time stamp on it. Every email. Every traffic ticket. Every arrest warrant. Certainly every document that passes through a computer has a time stamp on it. That includes every legal document. That time stamp comes from a computer, which typically isn’t very precise on its own. So, when an entire computer system needs to be more precise and synchronized, then it’s time to install a precision timing system, like the ones available at Masterclock, Inc. With every clock and device wired to and controlled by a keyboard and a software app, clocks can receive time signals from GPS satellites to maintain precise synchronization — including all adjustments for Daylight Savings Time and Leap Seconds — automatically. Doesn’t law enforcement have better things to do than to manually adjust their clocks back and forth twice a year? We think so. With calls coming in at all hours, 911 call centers need accurate time. Often the crime is in progress or an accident has just occurred. Time-stamped documents need to be generated immediately so, as time goes by, officers, lawyers and judges, in turn, can reconstruct the incident and reexamine the facts as stated in those documents to assess guilt, fines and punishment. This blog is brought to you by Masterclock, Inc.
We design, build and sell a large catalog of professional-quality digital and analog clocks, master clocks, network clocks, time code clocks, time code generators and other synchronized time devices for precise applications at an affordable price. about time, GPS, digital clocks or any other subject you’d like to know more about, sent them to us. We’ll be happy to reply directly. Come visit us at www.masterclock.com to see what we can do for you!